I’m super happy with how these cupcakes turned out and it may all be common sense to others but it took me a while to figure out that getting beautiful rose topped cupcakes is a snap. I’ve long had variations of rose topped cupcakes in my picture folder labeled “special treats” mostly in awe not really thinking I could do it. But let me tell you it’s as easy as buying a 2D cake decorating tip. Yup seriously. 2. squeeze the frosting through the tip starting from the middle and making a circle until you’ve covered the whole thing. The key is working from the inside out. Yup that’s it. I tried holding it sideways, turning the bag all fancy, but no it really is just point down and make a circle. 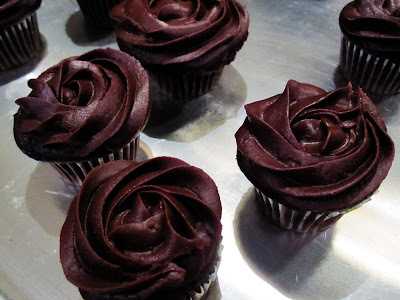 The tip and pulling it around the surface of the cupcake will make it twist without you having to tdo anything. Couldn’t be easier for such prettiness. If you do use ganache work fast or in batches because your hand will warm up the chocolate fast. Any ways these will make an appearance at tomorrow’s shower. On a totally different note, I realized that I have a good amount of raegun stuff that I’ve created but just forgot (I don’t know how) to list. 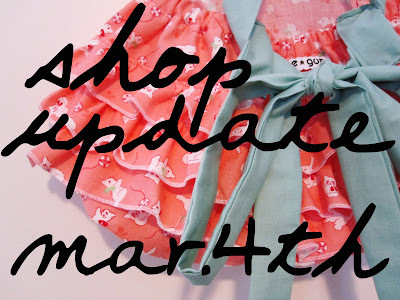 So, I’ll be having an official shop update with lots of new goodies next week, March 4 (oh my gosh it’s already going to be March!?). So if you’re looking to purchase the lovely showers set it will appear then, as will a couple new retro rufflers. I know I’d sold out of most of my rufflers so I’m trying really hard to buy enough fabric and get some good new options to start the warm weather off on the right foot. And don’t forget there’s a ruffle diaper cover gift set giveaway open. These look wonderful! I really wish I could have one right now! I just did my very first cake decorating class, and I can say for certain I’m going to be addicted to cake decorating and fun frostings very soon! This is great! Thanks for sharing. AWESOME–I Love them and they would be pretty in a multitude of colors. I am letting everyone know–if you haven’t signed up at the new blog, you need to RE-Sign up. Google doesn’t let you take your followers with you. If you have already done so –sorry for mentioning it. 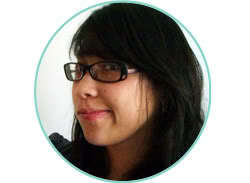 I am going back and forth between the old and new blog plus my old and new e-mail and I can’t keep it all straight. I am hoping to have the old blog finished up (moving everything) and closed down this week.